Colonel Sander’s family has responded to Papa John’s founder after he claimed Colonel Sanders used racial slurs. KFC founder’s grandson, Trigg Adams, has come to his grandfather’s defense after it was revealed John Schnatter, during a conference call in May, accused Sanders of using the N-word. During that call, Schnatter used the racial slur in a role-playing exercise that aimed to improve public relations, reported Fox News. Schnatter, 56, allegedly said, “Colonel Sanders called black people [omitted]” then claimed Sanders never received criticism for his comments. In response to the allegations, Adams said his grandfather did not use any racially offensive words and called the pizza chain’s founder a “weasel,” reported Courier-Journal. “Because he’s prejudiced, he’s trying to say somebody else was, too. [Sanders] had absolutely no prejudice against anybody,” Adams told the news website. Adams, who worked in his grandfather’s stores in the 1950s, explained that Sanders had employed black employees in his kitchens, and he never saw or heard his grandfather treating them without respect. He added that Sanders also donated more than $20 million to charities in his lifetime and race did not play a part in who he donated to, which included churches with black and white congregations. “He loved anyone who he felt was kind and good and faithful,” Adams said. 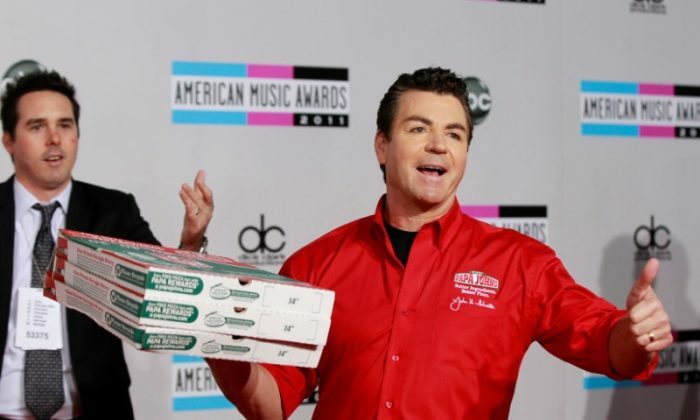 Schnatter stepped down as chairman of the board of Papa John’s International Inc. on July 11 after Forbes reported on the conference call incident, citing unnamed sources that were on the call with him. He apologized for his comment but added his use of the word was taken out of context. “I don’t condone racism in any way. Period. It’s just wrong,” he told WLKY during an interview. Schnatter also claimed in the interview that he was blackmailed over the racial slur. “They wanted $6 million to make it go away. I’m like, ‘I’m not paying you $6 million,’” he told the news station. “And they made it pretty clear […] the words were ‘If I don’t get my … money, I’m going to bury the founder,’ said one of the executives. Last December, Schnatter stepped down as CEO after he critcized the NFL’s leadership over the U.S. national anthem protests. At the time, he blamed poor pizza sales on NFL players kneeling during the anthem. He later apologized for his comments. Reuters contributed to this report. Additional reporting by Jack Phillips.